Both, company management and analysts, are more aware of range of benefints associated with taking advantage of spatial data. Loation Intelligence was born from joining worlds of GIS and BI together. Situation on IT market is rather interesting nowadays, as GIS software vendors are trying to acquire number of BI users with analytic capabilities, while BI vendors start to upgrade their solutions with mapping and simple spatial analysis tools. the decision makers who are recipients of these information products. First group needs data, tools and methodology, along with presentation tools, while others… need good analysts. Each company builds their advantage on the market with unique methodology and analysis, but there are some common tasks. 1. Customer mapping. Working with 10k customer adresses in spreadsheet won’t be enough and will be problematic. Adding a graph representing percentage of customers in given regions (for exapmle voivodships) still won’t do the job. 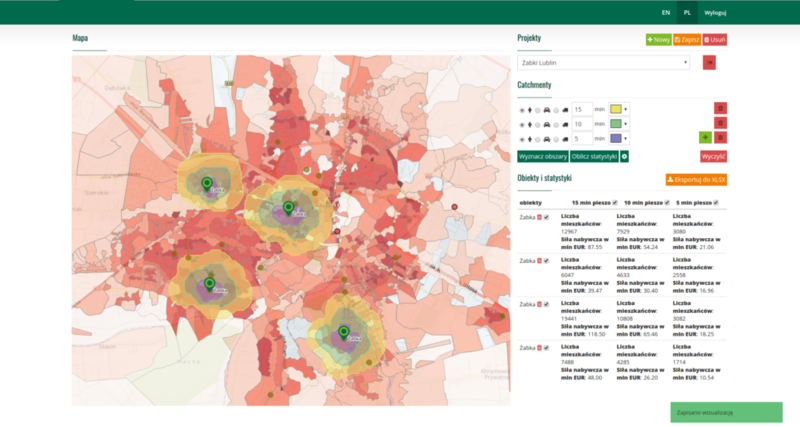 Solution based on presenting all customer locations on the map, where color represents for example client type, and size of point represent sales volume is much better to interpret. From that kind of information product we can get information about the maximum spatial range of our business market, occurrence of natural obstacles in reaching customer location (railroad crossings, bridges etc. ), sales volume at specific areas (hotspot and whitespot). 2. Statistics based decision-making. Combining customer location information with statistical data presented as chloropeths (cartograms), not only makes visual analysis easy, but also makes it possible to calculate indicators for given regions and helps answer questions: What is the ratio of the sales volume to income or the number of inhabitants i the neighborhood? Do all our facilities have similar customer potential within 30min drive time catchment? 3. Spatial analyzes Exapmle: You’ve got potential clients database in spreadsheet. You know than we have transport planned from Warsaw to Terespol on Wensday. The truck is half loaded. That is a possibility to select potential clients in given proximity of planned transport route, and start a discount campaign for them. How to do it? With tools shown below. 4. Analysis and creating service areas. Service areas are mostly delimited basing on zip codes or administrative boundries. Their reach is limited by number of sales representatives, customers, and distances between them. If the service areas are delimited correctly, it has a huge impact on your company’s operational efficency. 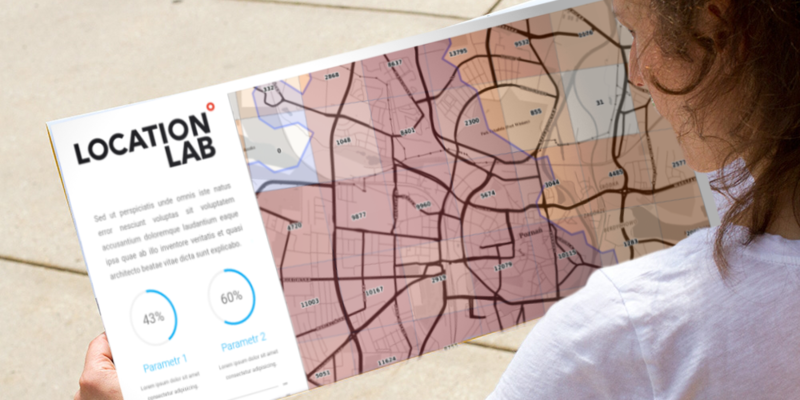 Location Intelligence provides you with data, tools, and methodology for service areas optimization. Also in hands of experienced analyst, will give you insight into dependencies and trends not visible in simple spreadsheets or databases. 5. Location Scoring. When you open new facility you take a risk which should be assessed with precison. In case of opening a new store, you have to consider: location of the store, location of your competition, distance from warehouse with supplies, rent prices, turnover of your stores in the neighborhood, socio-economic potential of the local market, terrain topography, key points of interest, accessibility and much more. All of the data above is spatial information that can be gathered and presented and than analyzed on map. 6. Carthographic visualizations and mapping. The result of each analysis is a report. In Location Intelligence reports are maps along with statistical information. Saying that the image is worth more than 1000 words is very true in terms of Location Intelligence.